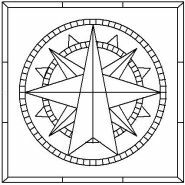 A compass rose is a figure displaying the orientations of the cardinal directions. This type of mosaic is great for areas such as an entrance or a staircase landing. Here you will find a growing selection of mosaic rose patterns. You can select from these or just let your imagination take over and create your own. If you find one you like and need help creating it, just let me know using the contact us page. I will gladly help you, from cutting and placing your pieces to choosing the right colors. 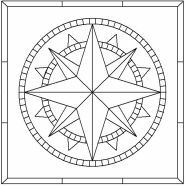 Remember that any compass rose pattern can be resized to fit your specific needs. 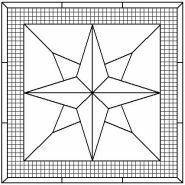 You can click on any mosaic pattern to get the detailed printable version. 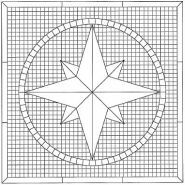 You can also combine any of these compass roses with other smaller patterns to create a larger mosaic. The preferred method to create these types of mosaics would be the indirect method.